Diaper Bags and BackPacks Guide - it's BABY time! Diaper bags are a must have for any parent. A baby requires having essentials on hand such as diapers, wipes, bottles, etc. Sure, the average woman carries around a hand bag of some type anyway so why does she need a diaper bag? These bags are specifically made for carrying around those essentials by keeping them organized and they come in all shapes and sizes. I’ve provided this informative diaper bags and backpacks guide to help you decide your options. Before you set out to look for that perfect bag, consider some common basic features. While diaper bags essentially all serve a primary purpose – to carry baby’s things, some have additional features and little extras that can make all the difference. Pockets – One thing that separates a diaper bag or backpack is that they usually have much more pockets than an ordinary purse or regular backpack. This makes it easier to sort baby’s things so you can easily grab wipes or a pacifier one-handed without having to dig around mindlessly at the bottom of everything else. They also usually have specific pockets that may be insulated for bottles. This can play a major role in choosing the right bag as some have roomier pockets than others and if you are going with baby bottles that are wider than traditional baby bottles they may not fit. Some bags also feature pockets specifically for mom to hold a cell phone, keys, and your wallet. Removable Inner Bag – Some brands include an inner bag within the diaper bag/backpack that can serve for multiple purposes. It may be used to hold extra things for mom such as makeup or other personal items so you can have everything in one bag. It may also be water-proof to hold soiled or wet clothes/cloth diapers to keep the rest of the items in your bag clean and dry. Changing pad – Most diaper bags and even diaper backpacks these days now come with a removable changing pad that you can wipe clean. Unless you already plan on buying a separate changing pad, look for a bag that offers a nice sized one to accommodate your baby. Some of your cheaper bags include a changing pad as an added incentive but they’re often not of great quality being smaller and thinner. Wipes Compartment – This is a really neat option that is becoming more available on diaper bags and back packs – a designated compartment for wipes! This frees up space in the main compartment of the bag for other things like extra outfits while giving you convenience when you to grab a wipe at a moment’s notice. Straps – This will play largely on the type of bag you choose. 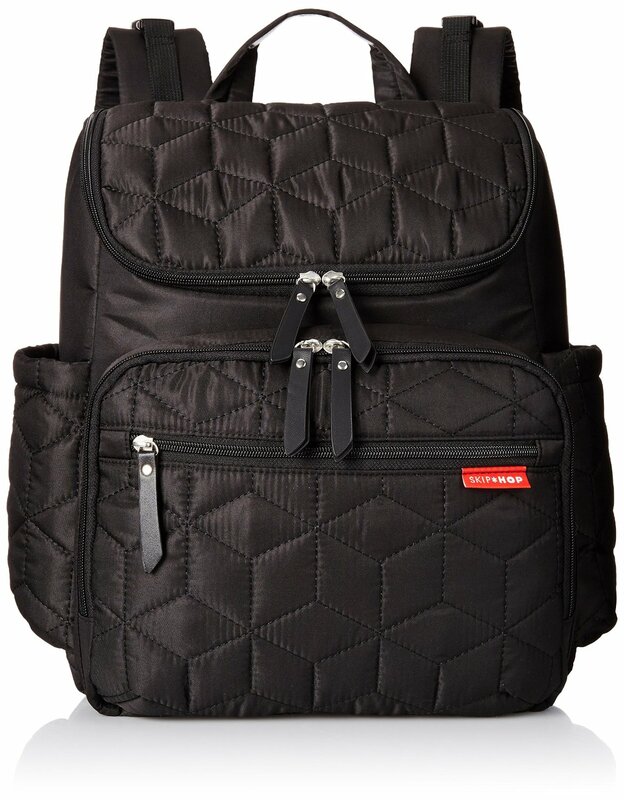 A variety of diaper bags feature one of 3 different styles of shoulder straps that may or may not be padded. Single shoulder straps – these are your bags typically worn on one shoulder at your side much like a regular handbag and may be one wide straps or double straps. Double shoulder straps – These are your basic backpack straps, designed to distribute weight more evenly. If you know you will be carrying it around often and with a good bit of stuff opt for one that has a padded strap for added comfort. Some diaper bags and backpacks also feature additional hooks that allow you to attach it to the handles of a stroller or even a shopping cart, which helps take the weight off. 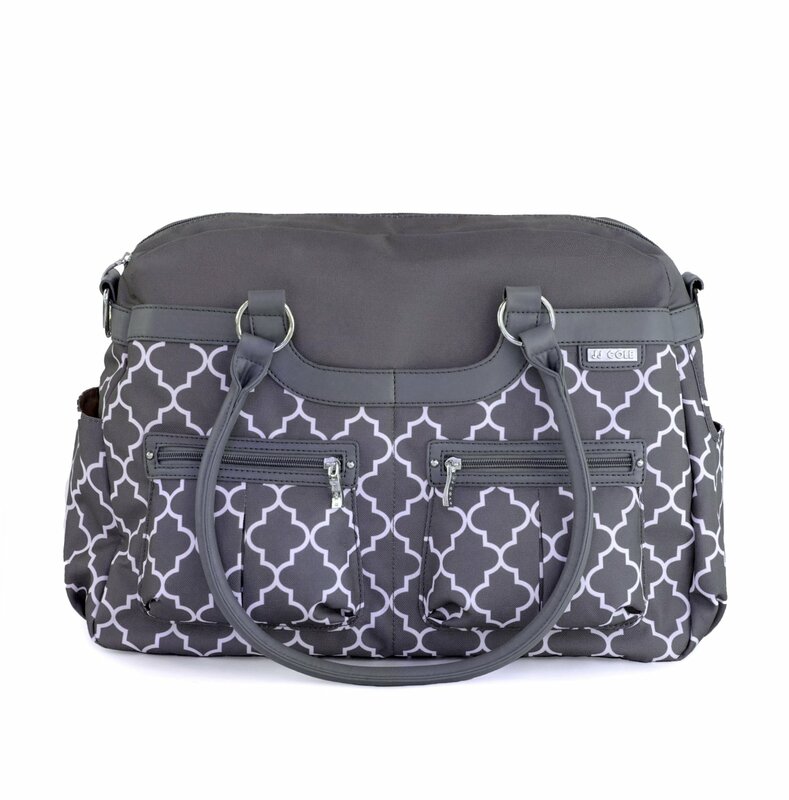 There are many different styles of diaper bags to choose from. These range greatly in price and made to suit parents with various needs whether you’re a fashionista, mom of multiples, sporty or live an active lifestyle, and even for dad! Your lifestyle will have a big impact on the type of diaper bag that will work best for you. Tote Bag – This is your more common diaper bag which is basically a bigger version of a handbag. They may consist of a sing wide strap or two straps that is usually worn on one shoulder and carried at your side. Tote-style bags give you a wide variety of styles to choose from plain to feminine or unisex. Messenger bag – Similar to a tote-style bag, messenger bags also feature a large bag that with multiple pockets, but offer a little more versatility. Sometimes referred to as a ‘sling bag’, a messenger bag has one strap that can be worn either on one shoulder with the bag carried at your side or across the chest with the bag carried in front, at your side, or back. 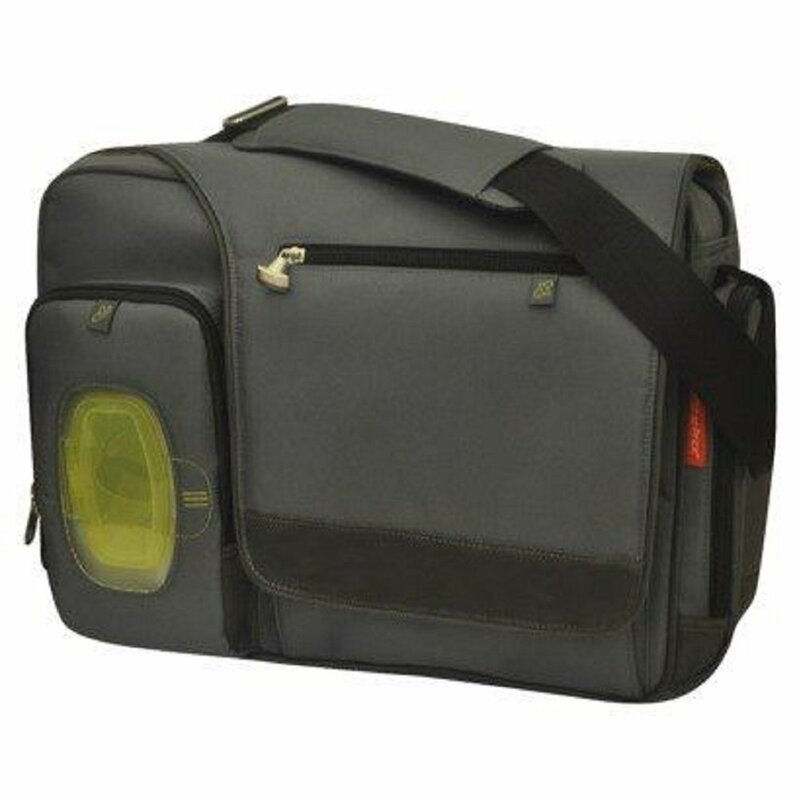 These are common bags of choice among dads and most styles can accommodate a laptop. Backpack – This is basically a backpack that is designed with extra pockets for specific things such as bottles, wipes, and sometimes a laptop as well. It is worn the same as a traditional backpack with two shoulder straps providing better weight distribution than bags worn on one shoulder. I recommend this style for parents with multiple kids as they are extra roomy and more comfortable to wear when you have a heavy load. Regardless of what type of bag you choose, keep price in mind. Just because a bag costs upwards of $100 doesn’t imply durability. A diaper bag will most likely get a lot of wear and tear so aim to purchase one at a reasonable price because you will probably end up buying another one at some point. Likewise, sometimes it takes trial and error to find the right bag. You may start off with a traditional handbag then decide a backpack is more suitable for you, so don’t overspend on a bag that may just be used for a short time. Just because you’re a mom it doesn’t mean you have to sacrifice fashion. If you love your designer hand bags, you can still be the cool mom with a fabulous accessory that is both functional and trés chic. 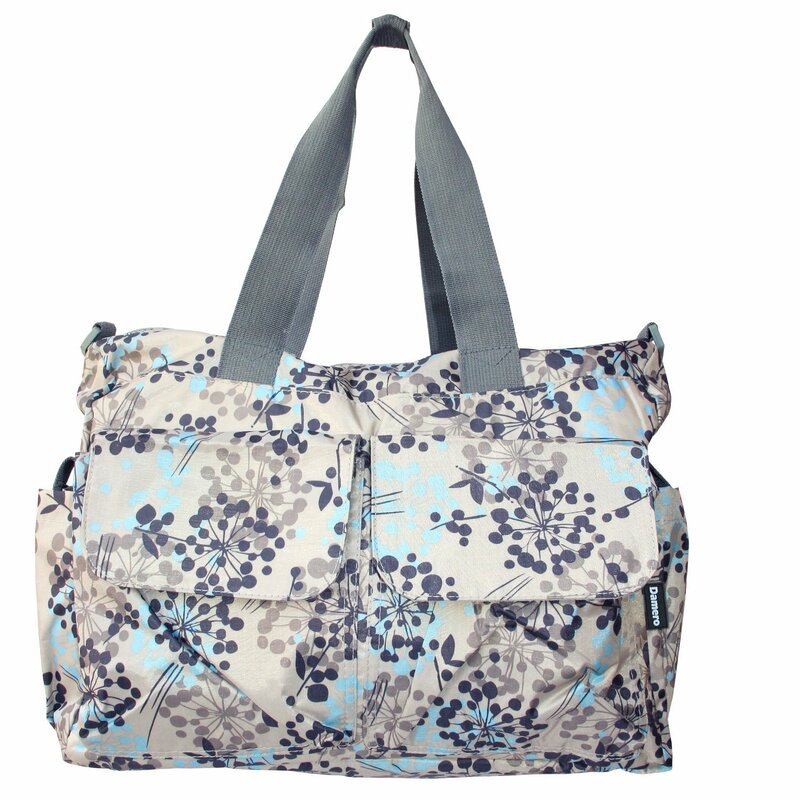 Skip Hop is a very popular and highly rated brand in diaper bags. 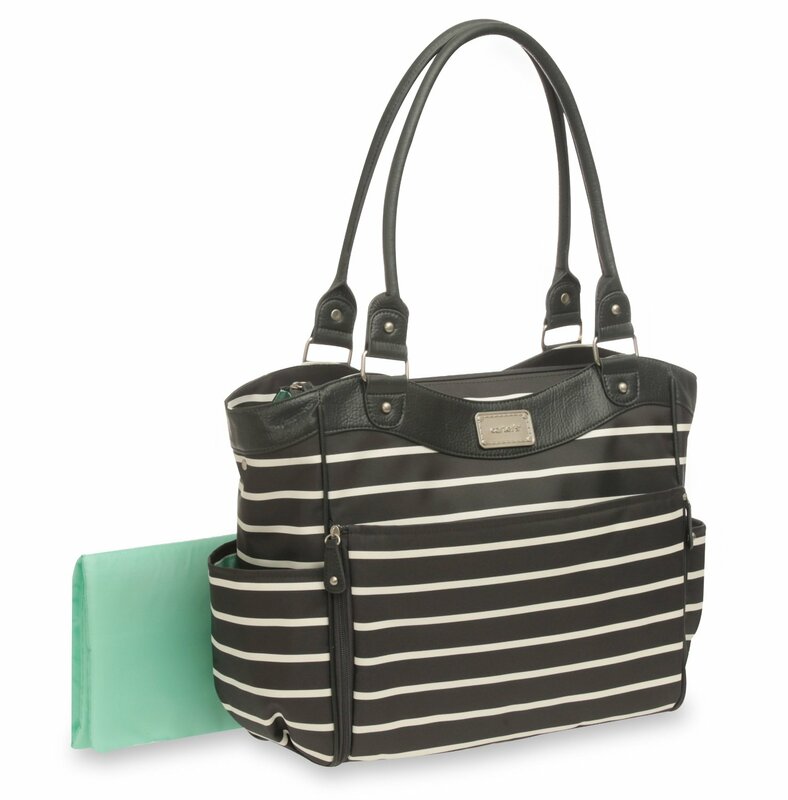 With a variety of styles from their signature bags this one features the latest trend in patterns, the Chevron stripe. 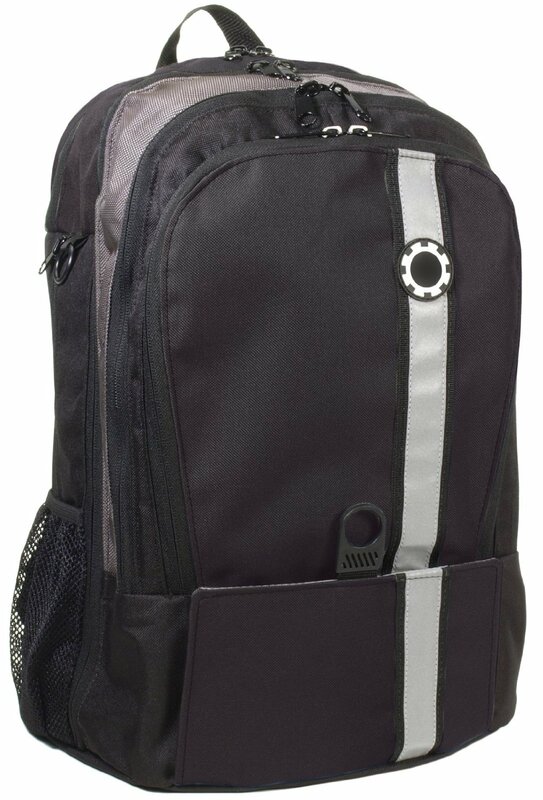 This bag has 10 pockets with a zip-close main compartment. There are two elasticized bottle pockets on either side and it features two different straps – carry handles or shoulder strap. 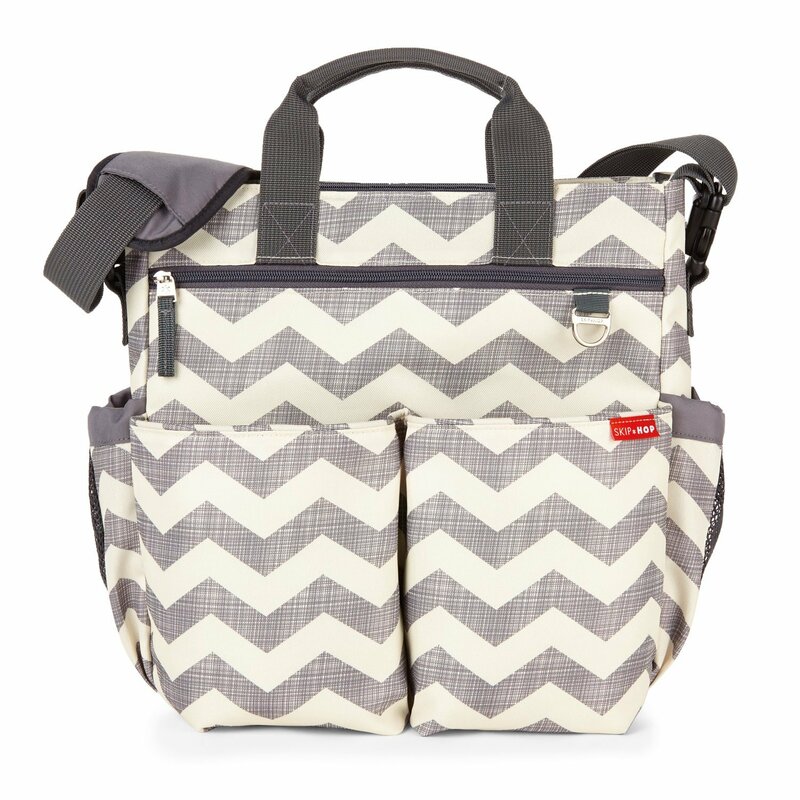 This adorable satchel diaper bag can easily double as a handbag once baby has outgrown it. It has 4 interior pockets and 7 open and zippered exterior pockets to keep baby’s things as well as mom’s necessities neatly organized. The bag comes with a matching changing pad and offers multiple carrying options with a removable padded shoulder strap and grab handles. For moms who keep it simple, this bag by LeSportsac offers chicness in an easy to carry bag with flair. The interior compartment is spacious for holding all of baby’s things while made with a lightweight yet durable Nylon material. 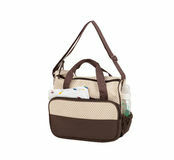 It comes with a coordinating changing pad and features handles and a clip-on shoulder strap. From the popular brand in baby products, Carter’s brings you this fabulous zip-close diaper bag that is easily disguised as a chic handbag. It features multiple compartments including two interior mesh and two exterior bottle pockets. The front pocket zips down and unfolds into a removable changing pad and comes with an accessory pouch for holding makeup and accessories or used as a wet bag for wet/soiled clothing. This designer bag combines style and functionality in a budget-friendly tote that has much to offer. The bag is made of easy-to-clean Nylon material, features many exterior and interior pockets, and comes with accessories including: changing pad, water-proof organizer bag, and a keep-warm bottle bag as well as a removable shoulder strap. It’s also available in several fashionable styles to suit your personality. As a mother of three I have gone through more than my fair share of diaper bags and can tell you I have never been more in love with a bag than the diaper backpack I last bought. I highly recommend this style to any mom who has more than one child in tow due to the spaciousness they offer and ease of carrying as opposed to a shoulder bag. 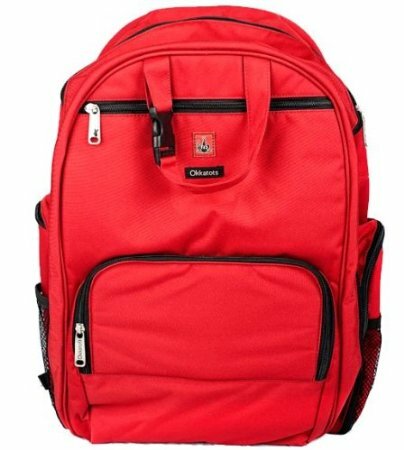 This may seem a little on the pricey side for a backpack diaper bag but is well worth it with recommendation by Consumer Reports and highly rated on Amazon. It comes loaded with convenient features like a diaper changing system, insulated bottle pocket that can accommodate multiple bottles or sippy cups, a removable ventilated pacifier pouch, and numerous pockets for baby items. The shoulder straps are padded for comfort and features a mesh cell phone pocket. When you think of backpacks style may not come to mind, but this one by Skip Hop offers sensibility in a fashionable bag with quilted detailing. With a variety of interior and exterior pockets there’s room for everything you need including a laptop or notebook up to 15″. 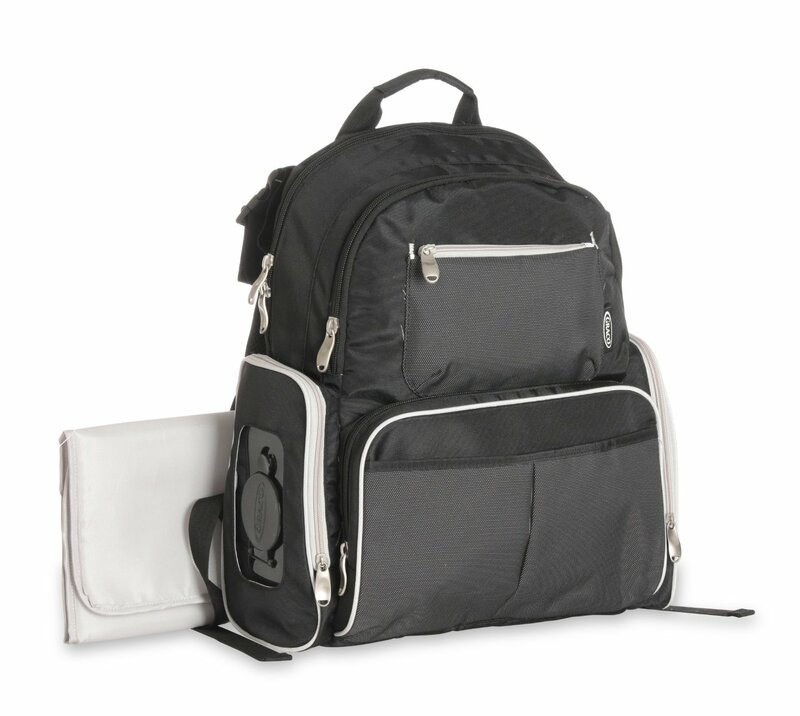 This backpack features a smart organizer system to offer a place for everything with a convenient wipes dispenser on the side for quick and easy access. There are numerous interior and exterior pockets with a large main compartment for clothes and an insulated exterior pocket for bottles. It has padded adjustable shoulder straps, a carry handle, and padded back for comfort. Dads have their own selection of sensible diaper bag options that work great as well. Check out these cool duds for dad to tackle on diaper duty in style. This is a popular choice for dads as featured in many magazines and across various parenting media sources. Its simple design makes it easy for dad to keep baby’s essentials on hand and organized with a large main compartment, 3 zip exterior pockets, and bottle pocket. The strap design is worn across the chest with a padded adjustable strap. Here’s a convenient backpack diaper bag for dad that keeps everything in its place. It features a quick access compartment in the front for wipes, two exterior bottle pockets that can each hold up to two bottles, a neat diaper-hammock pocket that keeps diapers at the top of the bag for easy access, and multiple mesh interior pockets. 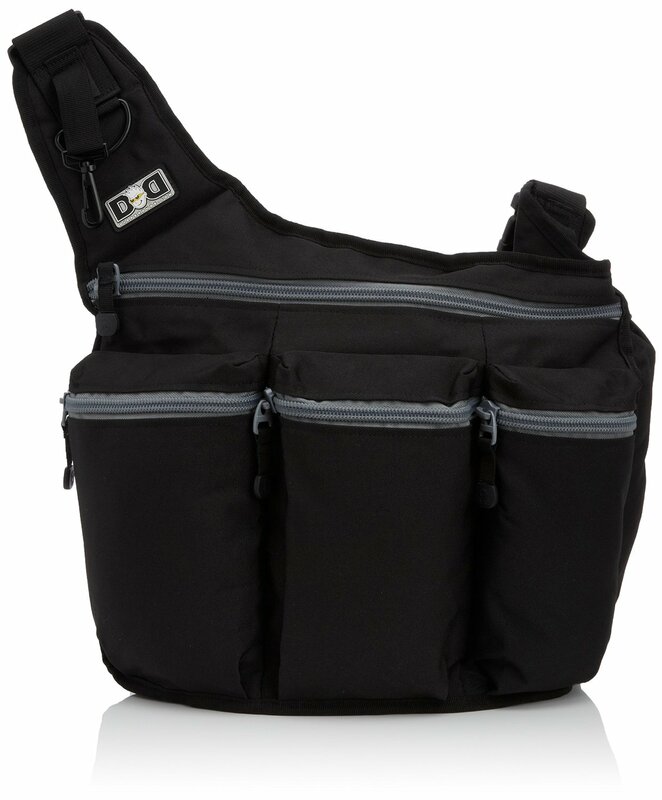 Ideal for dads and moms alike, this messenger bag offers sensibility. It has 4 external pockets for a convenient Fastfinder pocket system that makes it easy to grab things you need including a wipes dispenser pocket, insulated bottle pocket, pacifier pocket and a large pocket for diapers. It also features a reinforced bottom for durability to withstand whatever dad puts it through. **There are many styles of modern diaper bags on the market that also feature stroller straps or hooks to attach them to the back of a stroller. As a safety concern the Juvenile Products Manufacturers Association warns against using these as the weight of the bag can cause strollers to tip over which could result in injury to the child. As you can clearly see from this diaper bags and backpacks guide there are many different kinds of bags to choose from. For ease of use, my recommendation to moms is to opt for one that is hands free such as a backpack or messenger-style bag especially if you intend on baby-wearing. Whatever your personal preference or lifestyle may be, I hope you find this guide useful in your buying decision or when choosing one for your baby registry!